We did inform you about Microsoft plans to release some of the apps/games from Vista Ultimate Extras for Windows 7, and well they are finally here via Games for Windows Live. Microsoft today has released Tinker – a puzzle game in which the goal is to help a robot reach his home by solving all the misleading puzzles. Tinker offers 60 different puzzles for you to solve and master. You can find more about Microsoft Tinker, including a video demo from our review posted here. 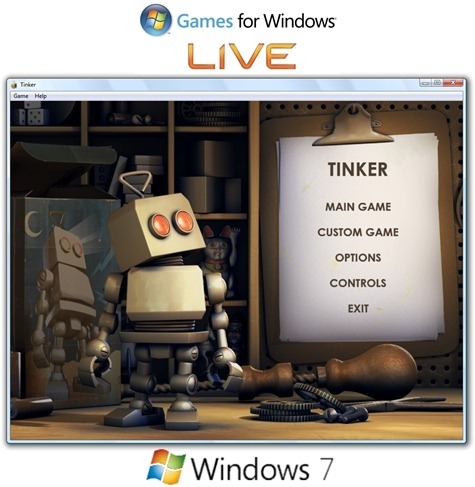 You will have to download and install Games for Windows Live in order to run Microsoft Tinker. Graphics and game play is exactly the same as it was when it was released for Windows Vista Ultimate as Ultimate Extras. But now it has Achievements!!! W00T!!! You dont need to enter your credit card details. You can skip this step you know.